You can’t go on the internet without stumbling into “clickbait” — those annoying yet tantalizing articles that you aren’t looking for, but that are designed to entice you to click on a link and see, for example, how “unrecognizable” some ’80s TV star is now. If you pay attention to clickbait (and of course you shouldn’t, but you can’t really help it, now can you?) you notice that there are definite patterns to it. The headlines for many of the clickbait pieces advertise something that is supposedly “shocking” or “jaw-dropping,” but a lot of them — say, 50 percent — also feature numbers. 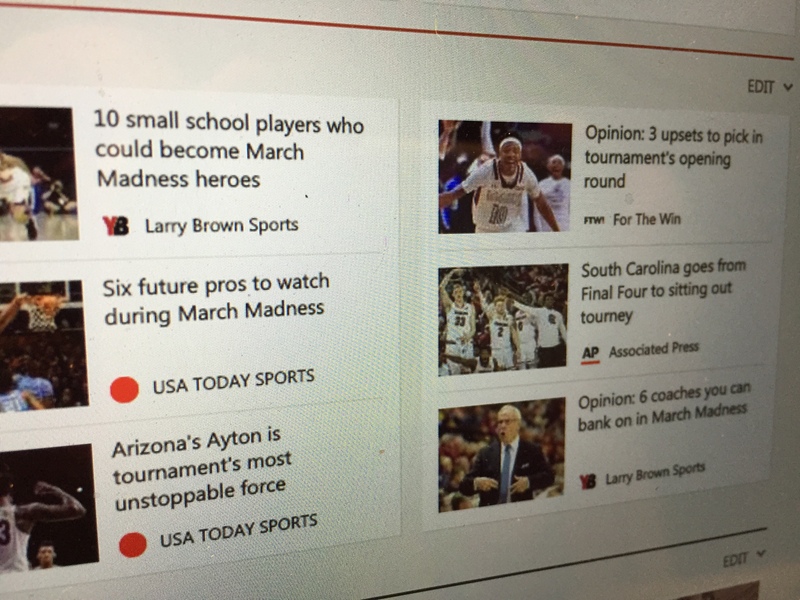 As in “6 reasons why your retirement planning is doomed” or “7 signs revealing that your boss actually hates your guts.” Today’s MSN website page, from which the above photo is taken, includes a bunch of sports-related clickbait, and numbers are prominent. Obviously, the clickbait brigade thinks numbers are likely to lead to clicks. Why? The article “Why We Respond Emotionally to Numbers: 7 Ways to Use the Power of Numbers in Your Designs” — which itself has a clickbait-like title — argues that humans respond viscerally and subconsciously to numbers. Even numbers, for example, are supposed to reflect feminine qualifies, while odd numbers are purportedly masculine. Numbers also are associated with luck and with religion. More basically, many games, especially those where you gamble, involve numbers. Obviously, numbers must have a deep intuitive appeal for homo sapiens, even those who didn’t like math class. In the case of clickbait, though, I think it is more than that. People on the internet are typically in a hurry, and clickbait by definition is something that you’re not actually trying to find. Numbers in the headlines signal clear limits on the amount of time you’re going to need to spend to check out that provocative clickbait. Typically the number in the headline is below 10, encouraging you to think that even if the article is a colossal waste of time, at least you’ll figure that out quickly. The fact that there are only 5 reasons to believe that the cast of Hogan’s Heroes was cursed might just tip the balance and cause you to move that mouse and cursor and click away. In some ways, the modern world is a better place than it used to be; in other ways, not so much. In one way, though, the improvement is indisputable: if you’re a sports fan wanting to relive a great success by one of your teams, modern technology allows you to string out the joy much, much longer than used to be possible. I watched the Cavs’ win the NBA title on Sunday. (I can still barely believe it, by the way.) Since then I’ve been reading every internet article I can find about the game, even scrolling through the often ignorant and foolish comments. Right now, I’m listening to a rebroadcast of the Mike & Mike radio show from Monday morning, to get that duo’s fresh take on the Cavs’ big win and LeBron’s personal triumph. And I’ve got no doubt that, if I wanted to, I could easily find enough new broadcasts, webcasts, podcasts, highlight packages, articles, columns, blog posts, YouTube snippets, and other “content” about the Cavs’ win to fill up weeks of leisure time. This is a big change from the old days, before the internet, before ESPN, before the NBA channel, and before every schmoe with a computer could write whatever he wanted. In those days, you’d wait for your Sports Illustrated to hit the mailbox and eagerly read the articles and look at the great photos — but that was it. Your team won, you were happy, but then you just had to move on, because there was no alternative. Now, you can revel in your triumph, immerse yourself in it, wallow in it. It’s a bit self-centered and selfish, perhaps . . . but boy, when you’ve waited 52 years for that big win, it’s a great thing, indeed. Forbes has reported that Facebook “conducted secret tests to determine the magnitude of its Android users’ Facebook addiction.” In the tests, which apparently occurred several years ago, users of the Facebook app for Android were subject to intentional crashes of the app. without being informed of the tests. Why would Facebook want to provoke crashes that would frustrate users who were trying to wish a Facebook friend happy birthday or post their latest selfie? Purportedly, to test the “resilience” of Facebook users. If your app suddenly crashed, would you just say the hell with Facebook, or would you try to access Facebook through an internet browser instead, or through a different app? When you think about it, intentional crashes aren’t really testing “resilience” — they’re testing obsession and addiction. After a crash, a rational person would avoid Facebook, for a while at least, reasoning that time was needed for anonymous techno-geeks at some far off location to address the cause of the crash and fix it. Only somebody desperate for an immediate Facebook fix would spend time searching to get to Facebook via alternative means, because nothing time sensitive ever really happens on Facebook. You can always send your friend an email expressing birthday wishes, or save that choice Throwback Thursday photo until next week. But the point, of course, isn’t whether it’s resilience or obsession that is being tested — it’s the fact that Facebook is intentionally frustrating its users at all. It sounds like the kind of experiment some evil scientist with a futuristic base on a remote island might use on hapless prisoners. After all, why would you knowingly thwart the efforts of somebody who is trying to access your website? Facebook no doubt would shrug and say the tests provided needed information — but really, it did the tests because it could . . . and it was confident that Facebook fans would keep coming back. We shouldn’t be surprised by this: Facebook has done similar kinds of tests before, and other companies do, too. On the internet, we’re all lab rats. Our movements are tracked constantly, but instead of scientists in white coats checking when we take a sip from the water dropper or stop running on the wheel or are responding to the electrodes placed on our hind quarters, data is compiled about which websites we visit, how long we stay there, what we click on, and whether we’re showing an interest in one product or another so that we can be bombarded with pop-up ads for that product forever. Time for another spin on the wheel! In the aftermath of the San Bernardino shootings, officials are looking at whether they may have missed clues that could have predicted the murderous death spree of Syed Rizwa Farook and his wife, Tashfeen Malik. And it appears that some blazing red flags were, in fact, not seen, and that the immigrant screening process employed by the United States is not, in fact, as foolproof as some advocates have represented. Strange, isn’t it, that in our modern, internet-obsessed age, where many people share their innermost thoughts and views on-line, that social media posts of an applicant for entry to the U.S. aren’t reviewed as a matter of course to search for violent, pro-terrorist, or anti-American sentiments? Wouldn’t you think that unprompted social media posts are much more likely to yield insights into a would-be immigrant’s true feelings than the answers given at a stilted, formal interview with a consular official? And it’s not as if the jihadists are shy about sharing their views on social media — after all, ISIS and other Islamic terror groups actively use the internet as a recruiting mechanism and are happy to post videos of beheadings and other bloody activities as part of their recruitment campaigns. Such justifications make no sense to me. Sure, social media posts endorsing violence might not be “definitive evidence” (whatever that means) that the writer will become a mass-murdering terrorist, but don’t we want to even check on whether someone seeking entry to our country has voiced such sentiments, and if so build that undoubtedly relevant information into our decision-making process — and maybe ask a question or two about such statements in that stilted interview? Why take a head-in-the-sand approach to available information. And why the curious concern about whether it is “appropriate” to look at social media postings? After all, social media posts are public statements, available to the world. Companies routinely review social media postings as part of the job application process, and parents counsel their children to consider how that Facebook picture of their embarrassing behavior at a boozy party might be perceived by a prospective employer. Yet the delicate sensibilities within our government are worried that it might not be “appropriate” to look at whether the likes of Tashfeen Malik have expressed violent, anti-American views before they decide to let them enter the country? It’s bad enough that Farook and Malik were motivated to gun down innocents in San Bernardino in furtherance of their own, twisted beliefs. It would be inexcusable if the government did not learn from the process by which Malik gained entry and use those lessons to improve our immigration protocols and enhance the information-gathering process. Establishing a mechanism for reviewing public social media posts of visa applicants would be a good place to start. It’s obvious that ad revenue on some free websites is tied to “clicks” — how many times people tap their mouse to access a story. It’s one way for the website to account for its traffic and provide data to advertisers who want to know how many people are seeing their banners and pop-up ads. Not surprisingly, many websites are set up to maximize clicks. That’s why you often need to click “next page” to read an entire article, for example. The most irritating aspect of the click-counting emphasis, however, are the articles that clearly are “clickbait.” You’ve seen them featured on the websites you visit, cluttering things up like unsightly litter on the side of a highway: where are members of the cast of an old TV show now, what “jaw-dropping” dresses got worn to a recent awards show, which celebrities have killed a person (number 8 will shock you! ), what “weird trick” will allow you to immediately lose 20 pounds or secure your retirement, and on and on. You’ve probably gotten to the point that you don’t even notice them anymore on the websites you visit. What’s discouraging about the “clickbait” phenomenon, however, is that even more high-end internet content providers seem to be unable to resist publishing their own form of clickbait. Those are articles that clearly are designed to stoke controversy and provoke criticism, in hopes that the articles will be linked and discussed on other websites. They’ll gladly accept harsh bashings if a few more clicks come their way. It’s sad, really, to see publications like the Times stoop to the level of clickbait. It makes me wonder what kind of long-term impact the internet is going to have on the quality of journalism in America. Grandma, who had a wonderful sense of humor, thought it was one of the funniest comments ever — so of course we grandkids did, too. But the driver’s jibe had an air of mystery and an almost lyrical quality that stuck with me. A heifer was a cow, or course, but what, precisely, was a Mullingar heifer? In those days, it would have taken forever to find out. I suppose I could have gone to the reference section of the library, spoken to a severe-looking woman who probably would have been suspicious of my purported interest in Irish cattle, and with her assistance possibly located a massive book about bovine breeds that was available only in the library of the Ohio State University School of Veterinary Medicine. It was too much work to satisfy a bit of idle curiosity, obviously, so I didn’t even try. But then the internet was invented! (Thanks, Al Gore!) So when I was thinking with a chuckle of the Irishman’s comment the other day, I entered “Mullingar heifer” into the little box on Google, and lo and behold, I not only found pictures of the mysterious creature, one of which I’ve now posted here, but also learned that “beef to the heels like a Mullingar heifer” is a traditional Irish colloquialism typically used in connection with ladies with stout legs. The latter discovery was a bit of a letdown, because for years I had been giving the Irish driver credit for coming up with a deft, original witticism. We’ll be moving into our new house in a few weeks, and one of the key impending decisions for us is: what to do about TV and internet coverage? 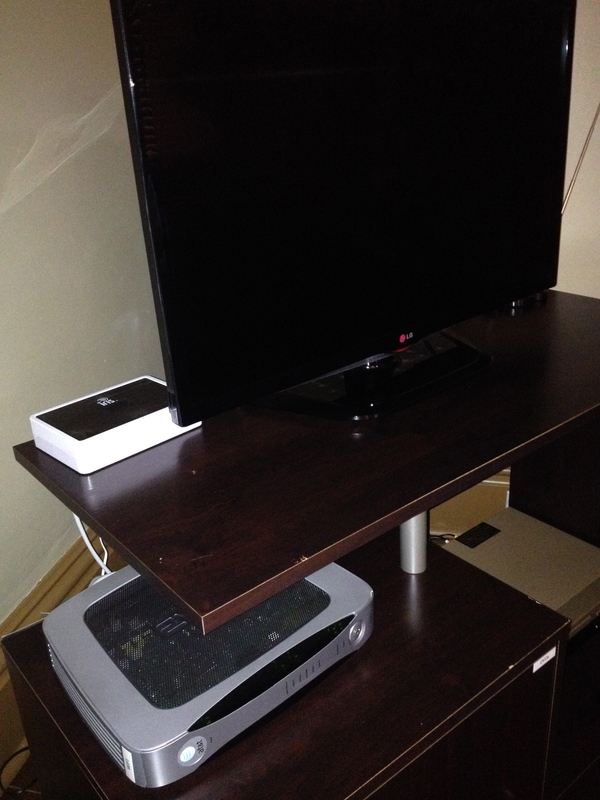 At our old house we went with cable-based service provided by Time Warner. Our TV and internet coverage was generally reliable, but it was expensive and we really grew to dislike — actually, “hate” is more accurate — Time Warner and its employees’ collective attitude about customer service. They seemed to revel in making us jump through stupid hoops for no apparent reason. We won’t go back to TW because we know we’ll just end up infuriated. WOW is the other cable provider in Columbus, but its on-line reviews seem extremely mixed — it’s great or it’s awful, with not much in between. The second option is a satellite service. Our new house already has a dish on the roof. I think it for DirecTV, but I haven’t paid attention because I don’t like the idea of a dish on my roof. Now I think it needs to be considered as an alternative. However, satellite services seem to only provide TV and “partner” with another company to offer internet — which just means, apparently, that we’ll have to deal with two providers rather than one. A third option is AT&T U-Verse “internet TV,” which would provide one-stop internet and TV. The house we’re staying in now has it and we haven’t had any service problems, but the TV offerings are limited and don’t include some of the “basic cable” channels that we’ve come to like, such as the Big Ten Network. Of course, that may just be a matter of getting a different package. The more high-end TV channels, too, aren’t simple to get to and involve juggling multiple remotes. And the final option is: only internet service and no TV. Since we’ve been at this house, I’ve gone for days without watching any TV. We’ve got friends who’ve forsaken TV and seem perfectly content. Maybe that’s an option — but I think we’d regret it when the next seasons of Game of Thrones and The Leftovers start and I want to watch a football game. We want to make an informed decision in selecting among a confusing array of choices. I’d be very interested in any thoughts on these options, and particularly in personal experiences with WOW, DirecTV or Dish, and AT&T U-Verse.